Dubai, UAE, December 26th, 2016 – The Mohammed bin Rashid Space Centre (MBRSC) has officially opened its section within KidZania®, the award-winning children’s edutainment centre managed by Emaar Entertainment in The Dubai Mall. 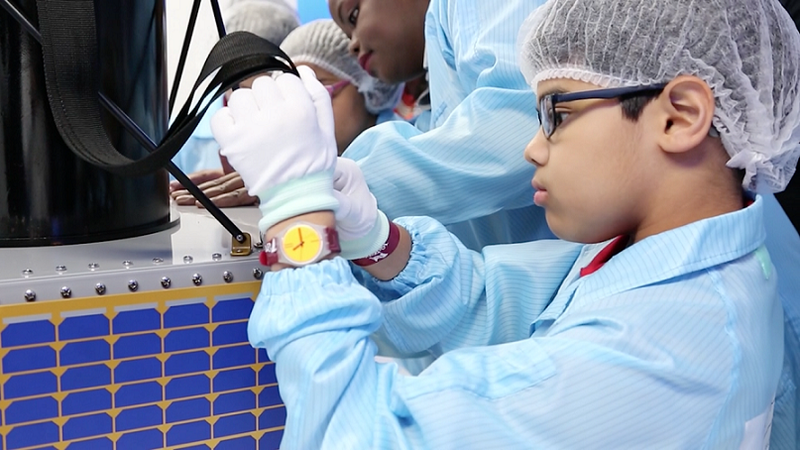 The new MBRSC space science and technology section enables the young visitors to join a team in designing and manufacturing their very own observation satellite, before witnessing the launch and then controlling the satellite as it orbits the Earth. Teams will be guided through the process within the new, interactive labs by a representative of KidZania®, and will have the opportunity to also learn about the projects already launched by MBRSC, and the ongoing projects, such as KhalifaSat and the Emirates Mars Mission. The partnership between MBRSC and KidZania® is representative of the Centre’s strategy to engage and inspire younger generations of Emiratis to become interested in science, technology, engineering and mathematics (STEM) at an early age, setting them up to enter into sectors such as space, aviation or engineering; sectors which are widely acknowledged to be pivotal to the UAE’s continued development as a nation. Located on the second level of The Dubai Mall, KidZania® is an interactive educational center which provides a unique and realistic environment for children to role-play and mimic adult activities and professions. Children can choose from multiple role-playing activities and perform ‘jobs’ such as dentists, television anchors, police officers, journalists, chefs, beauticians and so forth. They can enjoy driving, socialising and working in the indoor mini city which is built to scale for children, and furnished with paved streets, traffic lights, buildings, supermarkets, salons, banks, radio stations, hospitals and real world, recognizable destinations, sponsored by multi-national and local companies. CategoriesDubai Schools, Education in Dubai, Education in the UAE, Mohammed bin Rashid Al Maktoum Foundation, Study in UAE, UAE Ministry of Education.